In Pennsylvania, and most states, car insurance is required for licensed drivers. 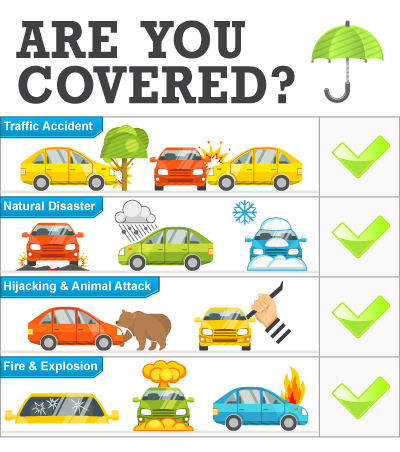 However, most drivers are in the dark when it comes to what is included in their car insurance coverage. According to a study by the National Association of Insurance Commissioners, roughly half of Americans do not understand the basics of insurance policies. Before you shop for car insurance coverage, be sure to arm yourself with knowledge so you’re not overcharged for coverage you don’t need. Liability insurance covers the cost of damage to other people, cars and property. For injuries, your car insurance policy must cover a minimum of $15,000 per person, and $30,000 per accident. For property damage, your policy must have a minimum of $5,000 per accident. If you have the minimum coverage of $15,000/$30,000/$5,000, it is not enough. See what you can do to raise your coverage levels. This form of car insurance coverage pays for medical expenses for anyone who is an insured under the policy, regardless of who is found at fault for the accident. Your policy must cover a minimum of $5,000 in medical benefits. Unlike traditional health insurance, auto medical benefits have no deductibles or co-pays. Auto medical benefits will pay for any and all treatment so long as it is related to a car accident. Auto medical benefits are very affordable and selecting higher medical coverage is an excellent way to protect yourself from incurring out of pocket costs such as deductibles or co-pays. Drivers may choose between full tort and limited tort coverage when buying auto insurance. Full tort allows you to make a claim against the at-fault party to be compensated for all losses relating to an accident including pain and suffering for injuries sustained in the accident. Limited tort severely limits your ability to make a claim for your losses and only allows you to sue out-of-pocket losses and for pain and suffering under very limited circumstances. Avoid limited tort coverage if at all possible or you may find yourself injured and suffering losses through no fault of your own and not able to make a claim against the responsible party. Your insurance will cover anyone permitted to drive your vehicle, as long as they are not specifically excluded under your policy. This includes those who are household members and are not. Most car insurance policies will cover you when you are driving a rental car. However, rental car companies can attempt to recover “loss of use” income in the event of an accident. This means that your regular car insurance coverage will cover the cost of damages to the rental vehicle, but not the lost income the rental company projects for the vehicle. Yet, your credit card company may cover such losses; be sure to check your credit card company’s rental car policy before opting for additional coverage. Depending on your coverage, a pet’s medical bills may be covered if it’s injured in a car accident. All licensed drivers in Pennsylvania are guaranteed access to car insurance. If you have been denied car insurance coverage from several companies due to a high risk status, you can buy a policy through the Pennsylvania Assigned Risk Plan. If you or someone you know has been involved in an auto accident and has insurance policy questions, call on the KBG team for help. We’re here 24/7 to get the Results You Deserve®.